Hi everyone! I am sad to have to report that our previous estimate was a little bit on the too-ambitious side, and we’re not going to be able to make our previously announced launch date of July 1. We’re really sorry about that! We’ve had a few things come up which have both created new work for us and also slowed development in parts. Which, of course, happens all the time, and you try to factor it into your estimations, but… well, it’s hard. Anyway, the TL;DR is that Auro’s new release date is August 15, 2014. This isn’t all bad news, by the way. The things that are holding us up are mostly technical programmy things (more detail below), which means that art and gameplay have been finished (actually, gameplay has been finished for a long time now). So, this extra delay actually means that you’re going to get an even more awesome game than you would have otherwise. At the end of the article I’ll run through a couple visual upgrades that Blake has given the game recently. I’ll now run everyone through exactly where we are and what still needs to get done. There are two significant bottlenecks keeping us from releasing the game right now, those being saving and device support. Saving/loading is mostly done; serialization has been done for awhile and Mike now has levels consistently saving, but there’s still a bit more work that has to be done on that (probably about a week’s worth). Device support is making sure that the game looks great and has no black bars on any devices that we sell the game on. We think this will only be a week or so of work, plus time for testing. Beyond those two things, there are a number of small things that still need to get done. The good news is, the polish phase is basically done. We have about 5 small items that still need to be put in, like shadows, some actor-shake effects, and maybe one colored overlay, but that’s really it. Story Mode also has a bunch of little tweaks that are still needed, partially ones that have always been needed, and a few new ones that are a result of some significant art upgrades that Blake took this extra time to make. Anyway, I can actually do 99% of that on my own time, since I’m now a low-grade programmer myself. But yeah – other than saving/loading, cleaning up story mode, making sure it looks good on devices, and a few small tweaks, there’s nothing left to do. Our plan is to have all of that done 3 weeks from now, on July 15. Then that leaves us 2 weeks just to do bug fixes and nothing else on the gold version. Then, on Aug 1 we’ll send the game out to the App Store and Google Play. I am so excited to get this game out to everyone. Believe me, no one is more frustrated than I am that this game is taking so long. I was the first person working on this game, which started almost 3 years ago, late 2011. At the time the project was just myself and a prototype programmer who I only worked with for a short time, so there is literally no one who has been waiting as long for Auro as I have (although I guess that’s usually the case when you’re the lead designer and project manager). Oh, another thing – we’ve been struggling with trying to figure out what to name our game for awhile. Of course, the name Auro is not going to change; the question is only over what the subtitle should be. The only reason, by the way, that we even need a subtitle is so that our game is searchable on various app stores. 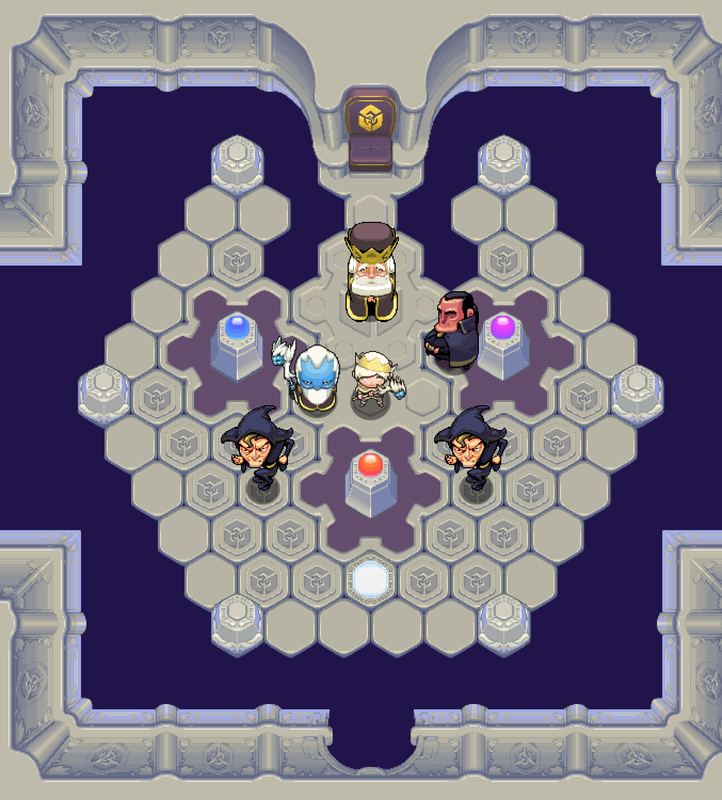 What we’ve come up with is Auro: A Monster-Bumping Adventure. “Bumping” is the core mechanism of this game, and I also think of it as kind of a icon for the game’s tone or spirit. “Adventure” is also fun, and fits with our Story Mode, which definitely is an adventure. 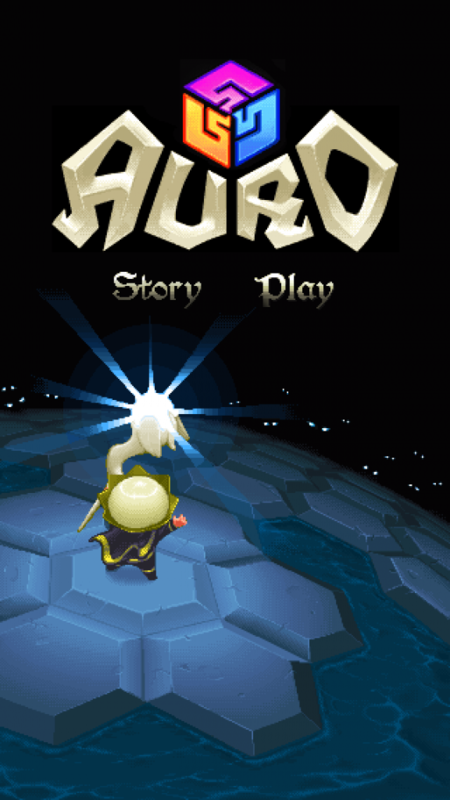 So, while this will be the full, official title of the game, when you see the logo you will usually just see “Auro”, by itself, without the subtitle. We think this is the best way to go. The good news about the delay is more beautiful Blake Reynolds pixel art has been infused into our game. The opening cutscene, for example, is the first time that the player really sees “the game”, so we really want it to be impressive. The throne room also gets re-used two times during the Story Mode, so it’s really important that it looks good. So, Blake created some new assets and slightly changed the arrangement of it to make sure it looks great. What do you think? Also, as you saw at the top of this article, the title screen image has been re-done. Blake wanted to do something more dynamic, more ominous. I think that this image does a better job at suggesting the possibilities and meaning of the game, whereas maybe the old one showed too much, and was perhaps a little awkward. This also includes a massive upgrade to the logo, which now reduces way better and just frankly looks better overall. Blake got rid of the texture and made the shapes of the letters look more fun and solid. Also the old icon had these tiny, tiny little shapes in the middle that didn’t reduce well at all. The new icon has been bolded up, and we also got rid of the bright highlights on it which also contributed to it not reducing well. We’re really happy with the new logo, and we hope you are too. Thanks for following our blog, and Kickstarterers, thank you guys again so much for contributing to help make this game happen.